Welcome to the interactive Bach Cantatas App for iOS. 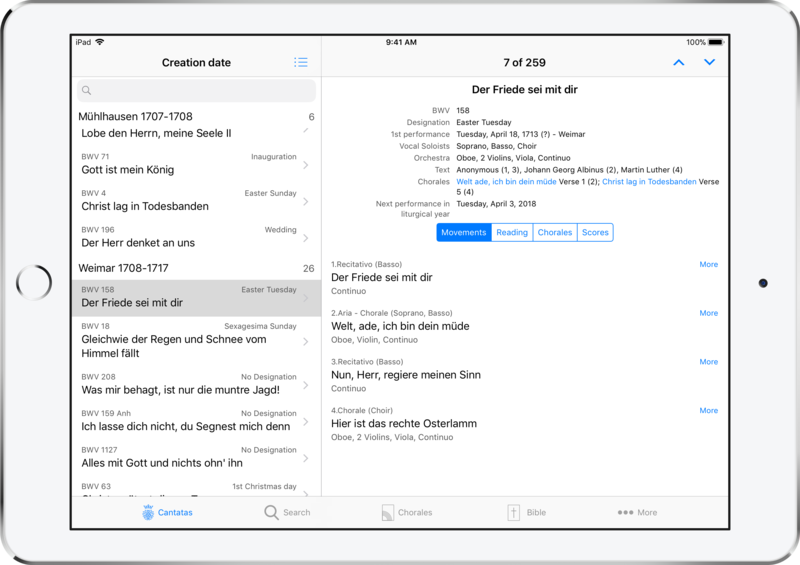 Learn more about the Bach Cantatas App. The interactive and extensive reference for all of Johann Sebastian Bachs cantatas. Available on the App Store for iPhone and iPad. Order the cantatas by title, opus number, destination or creation date. 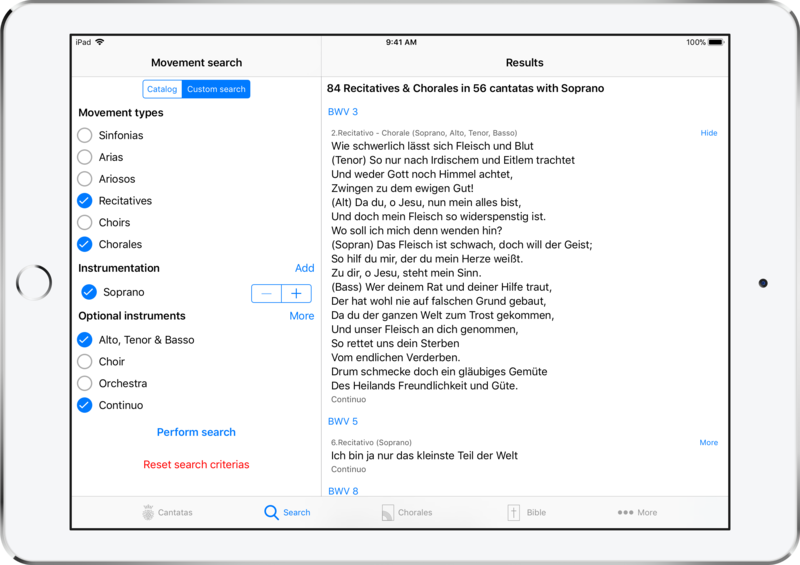 With the various sort options the App makes it easy and intuitive to browse Bachs cantatas. 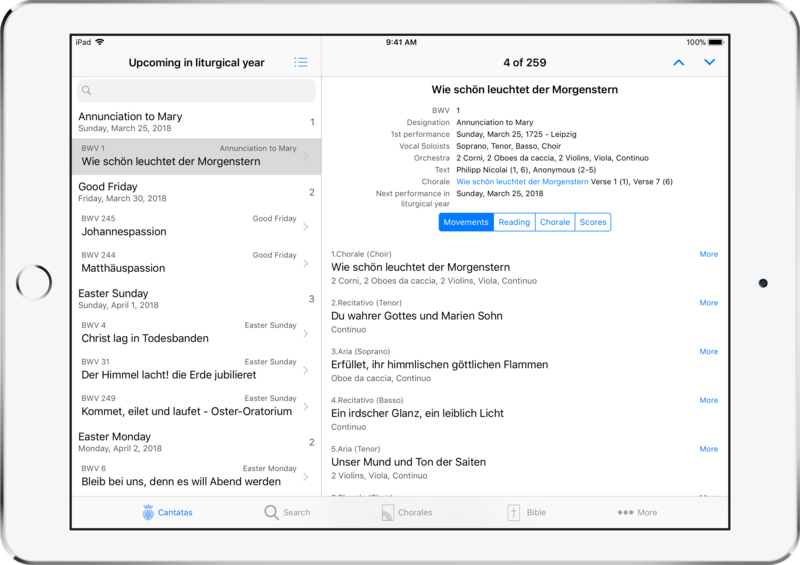 The Cantatas App provides an unlimited liturgical year calendar. View the cantatas in their correct liturgical order starting today for one year in advance. The App’s calendar performs all the tricky calculations and shows the correct upcoming performance date for each cantata. Discover all relevant information about each cantata: designation, performance date, vocal soloists and orchestra, used Bible references, lyricists and chorales for an inspected cantata. View all movements of a cantata with the complete text, instrumentation and even parody references. 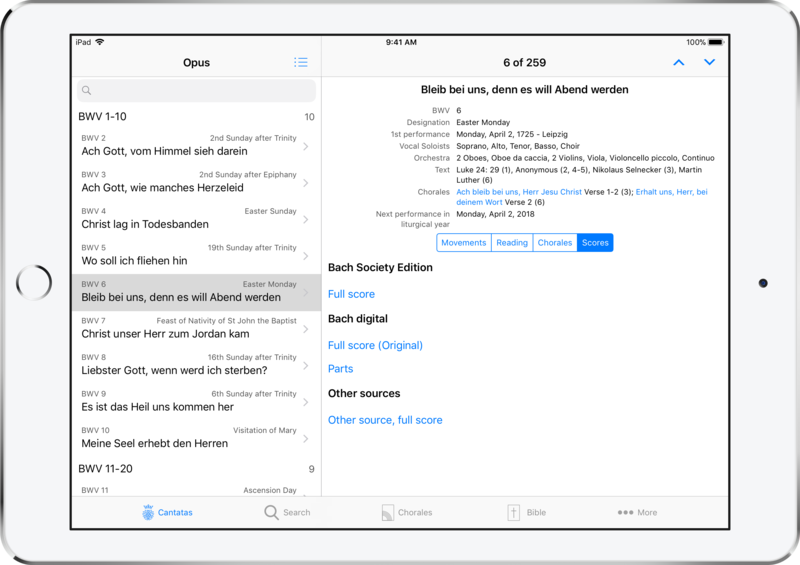 The App contains the complete scores of the Bach Society Edition (a.k.a. Alte Bachausgabe) and curated references to available scores on Bach digital. It has never been easier to browse Bachs music or look into the autograph scores. Read the epistle and gospel texts for all sacral cantatas. 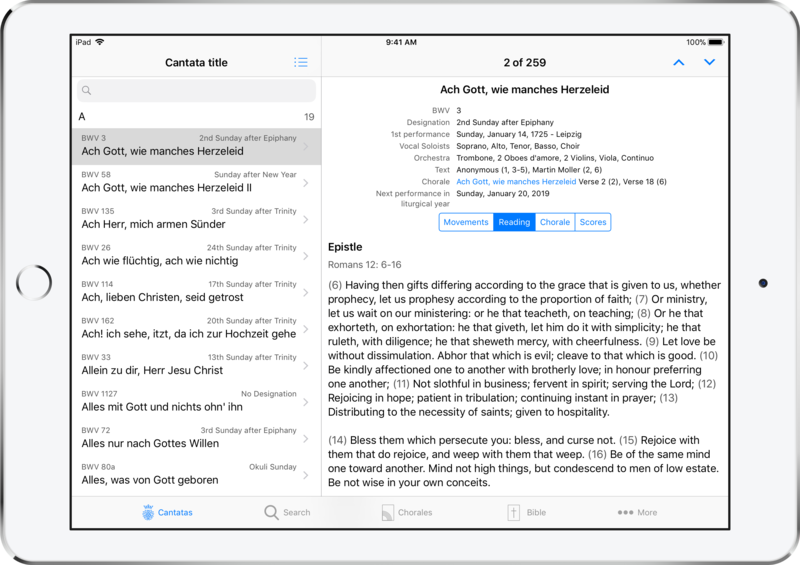 The app contains the text of the King James bible - so you can read the same text as Johann Sebastian Bach - in the easy to read modern english directly attached to each cantata. It is possible to specify your own search criterias. Pick whichever instrumentation you want, with the help of the Cantatas Apps intuitive human interface. All chorales used by J.S.Bach are delivered within the Cantatas App. Browse all verses (even those not used in the inspected cantata) and see which other cantatas make use of the same chorale. 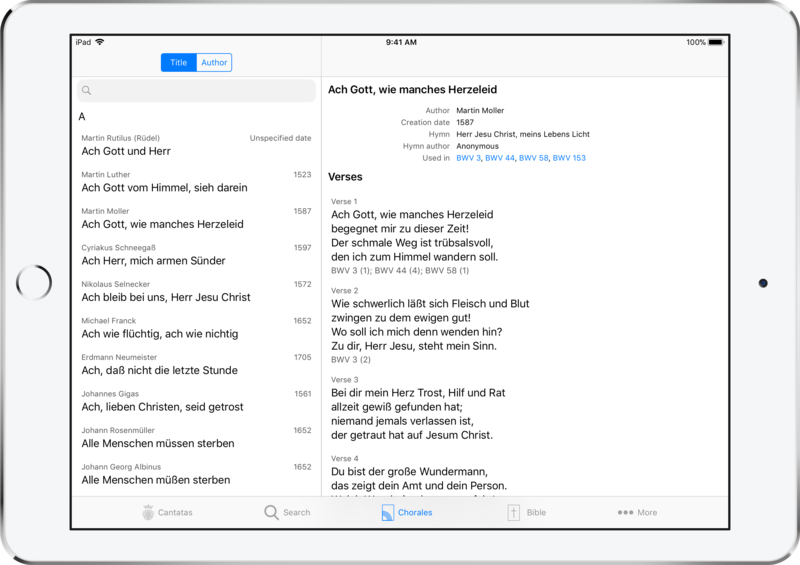 The App contains the complete King James Bible with an interactive concordance to Bachs cantatas. 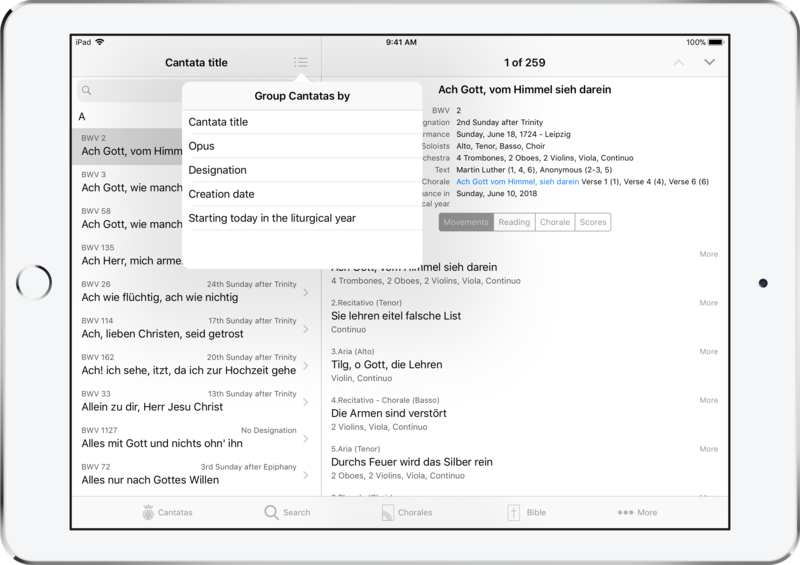 It has never been easier to find usages of biblical verses in cantatas. Switch the appearance of the App to either Day or Night, whichever fits your preferences best. 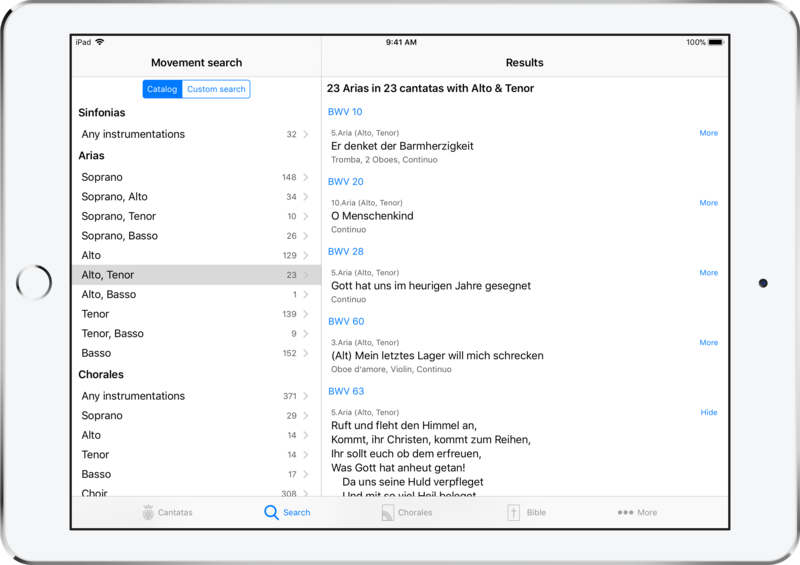 Find cantatas with the Spotlight system search on your iPhone or iPad, even without starting the App. Don’t take my words, take theirs! This is an invaluable resource for anyone interested in Bach’s cantatas. 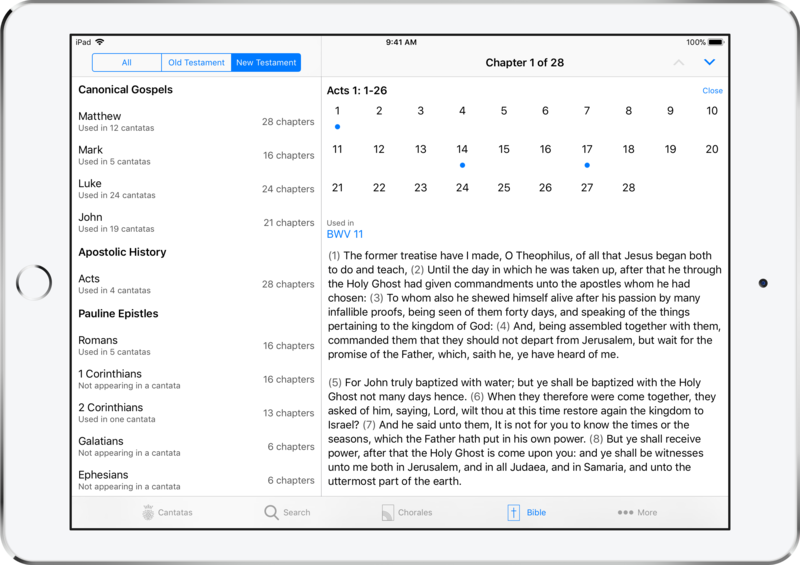 Beautifully designed, the app is easy to use and comprehensive in its detail. The ability to search the database using different criteria is of great value. Very highly recommended.